Flowerbykenzo La Cologne is a new fragrance in Kenzo's collection and it can be expected on the market in April 2010. With first days of spring charming La Cologne introduces fresh and clean notes of a composition which was inspired by classic citrusy compositions. 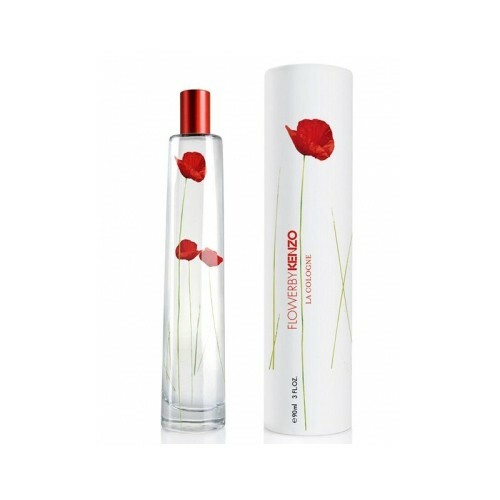 FlowerByKenzo La Cologne arrives in a tall, transparent flacon with a cylindrical, metallic-red stopper. Glass body of the flacon features poppy flowers, even though they are not present in composition of the new fragrance. They symbolize intention of the entire Flowerbykenzo line, which brings essences of pristine nature into centers of large cities. FlowerByKenzo La Cologne will refresh you with bergamot combined with orange blossom and a hint of black pepper accords. Bitter orange leaves add freshness which is softened with vanilla and musk in a base.